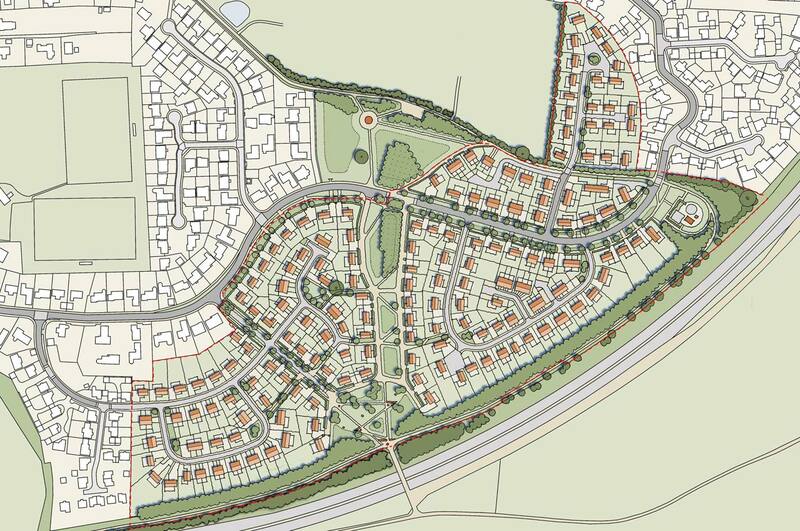 Lucas+Western Architects obtained outline planning permission for 200 new homes in Dereham for Robin Green Homes. The 12-hectare site, located between Dereham Windmill and the A47 Dereham bypass, was allocated for development in Breckland Council’s emerging Local Development Framework, and the proposals are developed from an earlier Environmental Scoping Study by landscape architects Sheils Flynn. Local plan documents identify a ‘green corridor’ running north-south through the site, and the importance of establishing pedestrian and cycle routes from the town centre through the site to connect to the open countryside beyond, via the existing footbridge over the A47. Our plan responds to this by creating a major new public green-space connecting an ancient track way north of the windmill to the footbridge, developed as an orchard and meadows. The site contains only one mature tree, an oak, which is shown retained. The plan also indicates a new tree-lined boulevard, a generous verge and new trees along Greenfields Road and new buffer-planting to the completed acoustic berm along the southern edge of the site. This ‘green framework’ divides the site into four smaller development sites, and will give the development a strong identity, with the windmill as its key landmark. With the number of homes and amount of open space stipulated in the proposed allocation, the net development density is quite low – around 24 dwellings per hectare, compared to the guide lines of 30 to 50dpha which has been more prevalent in the last decade or so – and this would allow the site to be designed using mostly wide-fronted detached family homes with front gardens and in-curtilage parking – a traditional and enduringly popular format. Our early massing studies show contemporary pitched-roof houses, inspired by our work for Abel Homes at Drayton (see Hus22).